It doesn't matter how many boxes of Cadbury Chocolate Fingers I buy here in our local supermarket, I can never figure out why the French packaging has lost an "s". Having said that, it's a good talking point for revising plurals. And lovely dunked in a mug of tea. Our Book: did you know? We're still on a little fluffy cloud of disbelief that the story we came up with en famille has really become a book! We received our copies a couple of days ago and a great deal of time was devoted to sitting just looking at it. You'll say I'm biased, but it really is a beautiful object; I do love books, but when it's your own book in your hands, it really is an incredible feeling! I'll share a secret with you - one of the things that I'm most proud of is the spine. Years ago, when I worked in video games, a graphic designer pointed out that packaging and book spines were written in different directions for the French and UK markets. I couldn't believe that I had never noticed this before, given that at the time I had quite a large bookshelf in my flat. I wanted to be sure that we wouldn't overlook this detail on our book. So no need to turn your head in different directions to find this book on the shelf! Test it out at home, order yours from our publisher! Comics are really popular in France. I have to confess I've never read one. I've tried to read Asterix several times, but my eyes involuntarily skip across the page, rather than reading the speech bubbles in order. So it's funny to see Puce starting to read comics for kids and it let's me get more familiar with this writing and illustration style that I never really got to know. I've been thinking about different writing styles recently as I realise that I can't stay in my comfort zone for ever. If Puce's English is going to continue to grow, I need to expose her to all of the different kinds of writing that you would get to play with in the UK - not just fiction books. Playing around with Powerpoint is one way of doing this, learning to write short, sharp bullet-pointed summaries, although it's hard to get past the fun of adding colours and animations. We tried condensing a story down to 140 characters, just to see how much more difficult it is to write something short. Last night, I tried using the comic style to make a point. We get through a lot of pens in our house, but sometimes the fun of acquiring them outweighs the necessity. A discussion about whether a particular pen was actually "broken" and what that word meant was getting nowhere. So I used the pen in question to draw this. We've had many adventures as a bilingual family, but this is perhaps the most exciting so far. Today, a book with our names on is leaving a printer's just outside Lyon. 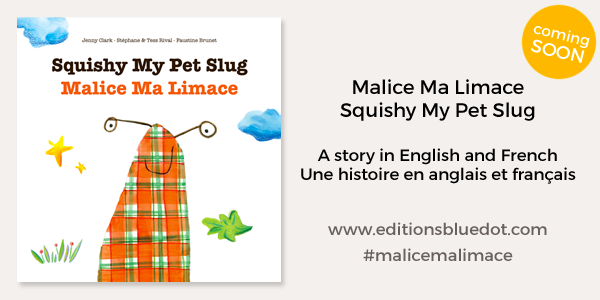 Squishy My Pet Slug in English, Malice Ma Limace in French is a story that we wrote when we were living in Scotland. At the time, Puce was desperate for a pet, but we had neither the room nor the possibility as we were living in rental accommodation with no long-term view. We were finding it harder to get a variety and exposure to French books for Puce. Adamant about sticking to the OPOL method, it did sometimes seem a pity that we couldn't share our stories; Mr R and I started thinking it would be nice to have a story that we could both read and talk to Puce about. It was only when we found a huge slug on top of our compost bin that we had the idea of writing our own story. What would happen if we adopted this slug as our pet? It's often the things that seem ridiculous that generate the best inspiration. As a family, we agreed on a story that we would like to read. Mr R wrote it in French, I wrote in English and Puce set to with biro and scrap paper to draw pictures to accompany the words, drawing our languages together through images. Mr R made a video and uploaded it to Youtube. We were quite happy when we had about 200 views after a couple of years, it was a lovely souvenir of our time in Scotland. Back in France 3 years later, chatting to co-founder of the newly created bluedot editions in Lyon, I mentioned the story and video...and the project for a book was born. Bluedot reached out to the talented and ecologically-minded illustrator Faustine Brunet, who accepted the challenge of bringing Tess' original drawings to life with colour and embellishments. The result is a beautiful, simple, playful book that makes us smile every time we look at it. I love that this is not a translation - there is not a dominant language that has required the other to search for equivalents, which is in harmony with how our family balances languages. 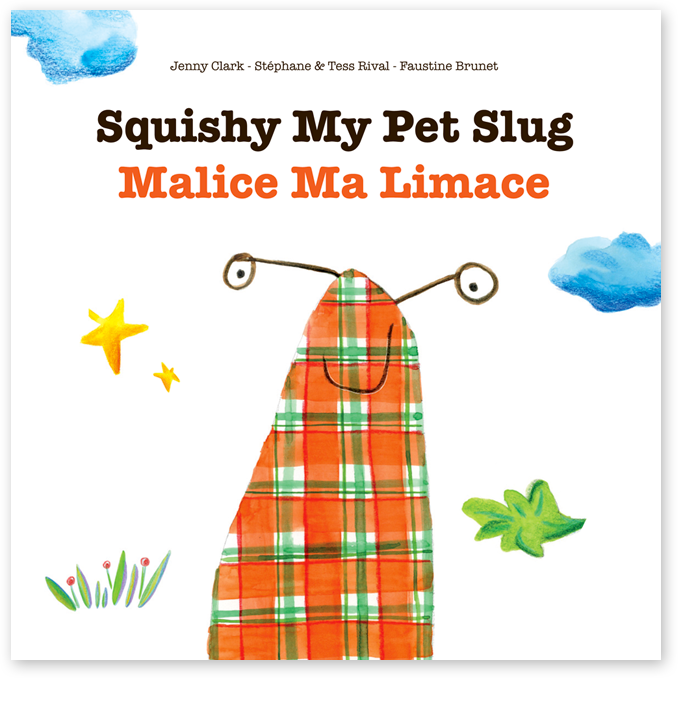 Mr R wrote using his vision of the tale, I wrote as I would recount it - the slug is he in English and she in French, it just sounds right that way. I love that Puce's amazing vision of the main character jumps out of every page (would an adult have thought of drawing a slug with a camera?!). 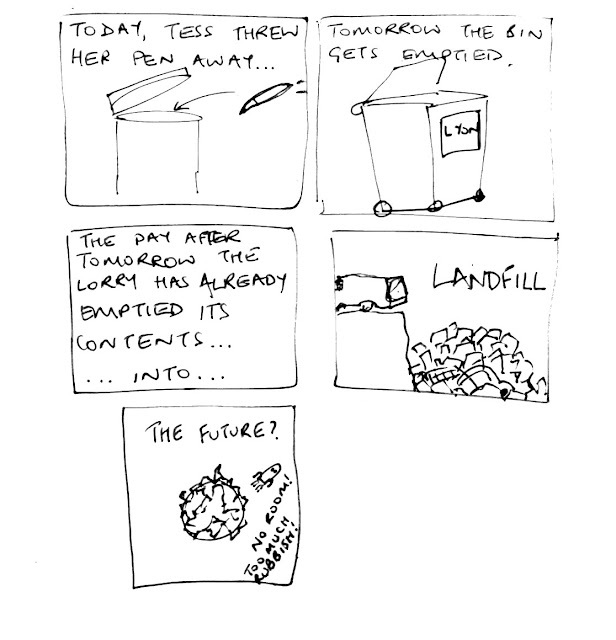 I love that Faustine has managed to keep the original drawings whilst making some of them more "legible"! And I love that an early suggestion as to the slug's attire became a reality: the tartan illustration used in the book has been made into fabric using Woven Monkey. Not only did my mum create the character so that a local bookshop A Titre d'Aile can use it as a window display for the launch, but also Anne Ponsoye of the Fees et Geste workshop in Lyon will be running workshops to create Squishy/Malice tote bags! Will this be the next Gruffalo in terms of must-read books for children? Who knows...but throughout this project, Puce has learnt about so many different careers that exist, working together to help celebrate creativity and make a lasting mark on our cultural landscape. Thank you to everyone who has been involved and thank you to bluedot editions for bringing this book to life! I've never played Scrabble. I like reading, I like words, but for some reason Scrabble has just never appealed. When we moved back to France, I was looking for games that I could play with Puce that would help us with spelling; Bananagrams was getting good reviews on Amazon so I ordered it. When it arrived, I fell in love. Finally, games makers had come up with a container for a game that is useful, sturdy and doesn't take up much room (essential when you live in a tiny flat!). Not only that but the tiles feel solid rather than little bits of flimsy plastic. Despite all this, Puce and I didn't quite get into it. So the lovely banana bag sat in the games box for nearly two years, completely neglected. It took my sister in Scotland becoming a Scrabble fan to get us into Bananagrams, which is admittedly a strange route to take. A visit to Scotland and a Bananagrams pouch as a housewarming gift suddenly had the whole family round the kitchen table. At midnight we decided we really ought to stop...after one more round. That was the first of many heated games. "Heated" because for some reason Mr R (a native French speaker) keeps beating us all, which has caught everyone off guard and made me very suspicious that his English level might be a lot better than he's been letting on all these years...We initially answered his questions of "is this a word in English", but quickly stopped helping him as he didn't need it! The way the game works is that you really play against yourself, making your own crossword puzzle, constantly changing letters round to use them all up. Back in our flat in Lyon, France, we play in either English or French (although Mr R grumbles that the letters aren't suited to French - ie, he's not winning as much), which means that Puce hears both me and Mr R asking if this or that is a real word, how do you spell it, can I add this tile, etc...She sees that we're all learning and asking questions which in turn has had a very positive impact on her enjoyment. Puce either plays herself or in a team with a grown-up or alternatively she's the one who "Looks in the Book", which means she's in charge of checking words in the dictionary if we're unsure. It's a win-win situation as she's talking about spelling, having fun and using a dictionary! It's a bilingual parenting dream come true! Needless to say, there are now Bananagrams in our flat in Lyon, both my sister's and my parents' houses in Scotland and the Spanish version on its way back to Colombia in my brother's suitcase! 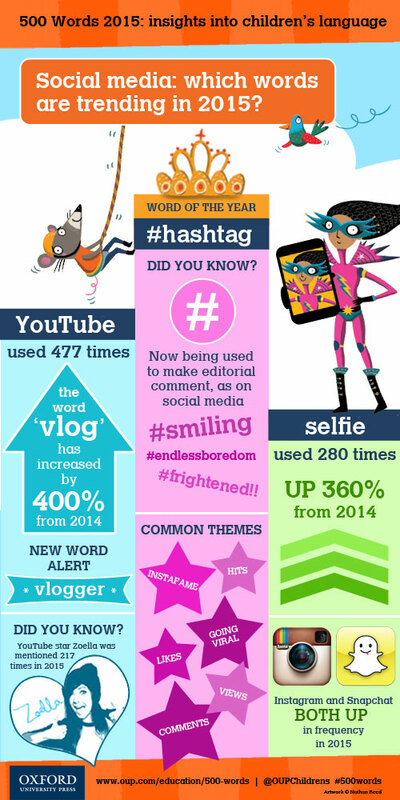 It's that time again - following the annual 500 Words Competition for children 13 and under, Oxford Dictionaries analyse the language used in the 120,000 entries receieved. They compile this information and present the findings to give an insight into how children today are using language, the concepts that they write about and the shifting trends of words that come into and fall out of favour. Living in our little minority language bubble, this makes fascinating reading. More information here. As the years pass, time becomes a rarer commodity, so finding fun ways of sharing and developing our family's minority language (English) becomes a bigger challenge. Games are an excellent way of diversifying language skills - from reading the instructions, understanding and explaining the game to each other, reading parts of the game through to finally playing (not to mention arguing about the correct way to play...). The actual playing then carries with it a whole new range of interactive vocabulary - and the inevitable banter that goes with it (so you think you're going to win, eh?). 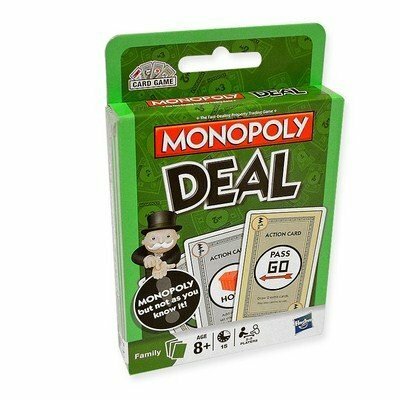 When it comes to card games, we've stumbled upon a game that is now our number one family favourite: Monopoly Deal. I've never been much of a Monopoly fan (unlike Mr R) and I probably only played a couple of times in my life, so I was a bit wary of this. But I was looking for a card game that would be a step up from Uno, something portable, in English with enough of a challenge to keep all of us entertained. With 146 reviews on Amazon and an average of 5 stars, this seemed like a safe bet. A more straightforward version of the board game, luck and strategy mean that we all have a chance of winning - if we play our cards right. The level of difficulty is just right for a family - not too hard for the seven year old, not a walkover for the 38 year old. A game lasts about 15 minutes and provided you have a table (or floor) to spread the cards on, it can be played anywhere - the deck of cards is no bigger than a deck of standard playing cards (I'm getting heartily fed up of opening up a new game to find that it's 60% packaging, designed and constructed to justify the price - we're running out of space in our "compact and bijou" flat!). Hi! I'm Jenny! After two years in Scotland, we're back in Lyon, France. This is where I write about how we balance English and French at home and my experiences sharing our languages with other bilingual and non-native speakers.